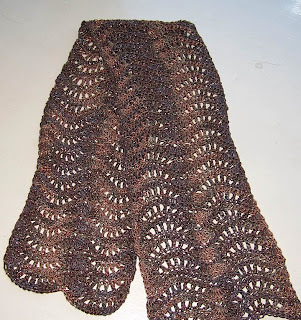 Just added my Feather and Fan Scarf pattern to Ravelry. You can get it free here or get a PDF file of the pattern here: download now. 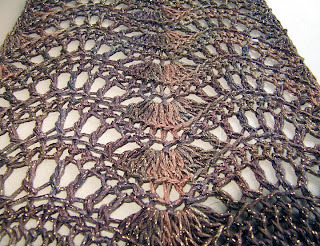 This one came about when I fell in love with a knit feather and fan shawl at my favorite yarn store. I'm a slow knitter, so it would have taken me forever to make. But with crochet I could make it and wear it the same week. I love the drape and texture of this scarf; it feels so elegant in Blue Heron's Rayon Metallic yarn. 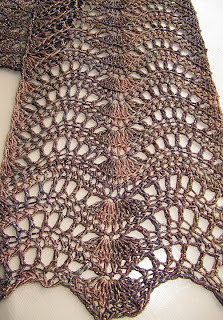 And it would be easy to enlarge to make a shawl (directions are in the pattern.) I've got 10 of my patterns on Ravelry now. I feel so designery.